Winners of the Grand Business Challenge, Rutgers Business School. MBA student teams representing top business schools from around the world competed at the inaugural NC State Grand Business Challenge held November 3 to 5 on the NC State University Centennial Campus in Raleigh, NC. The competition was hosted by Jenkins MBA program staff in the NC State Poole College of Management. The MBA teams’ mission: To solve a series of three real-world business challenges regarding IT security in the life sciences industry, a highly competitive market where the development of one product can take many years and cost billions of dollars to go to market. Merck, a global health care leader working to help the world be well, sponsored the inaugural NC State Grand Business Challenge. The competing teams were tasked with providing solutions for three challenges: Foundational, Succession and Storyboard. The MBA teams’ responses to each challenge were judged by a panel of industry experts. 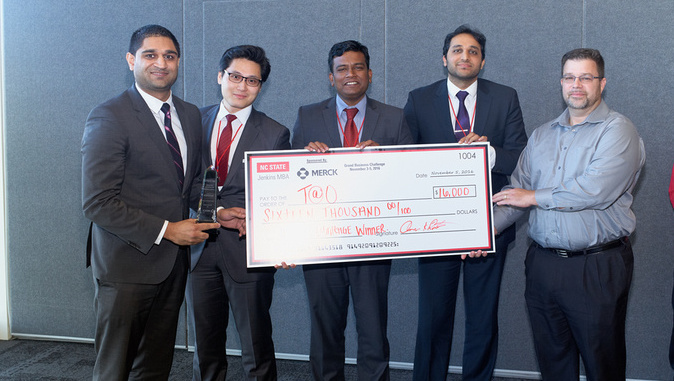 The MBA student team from Rutgers Business School placed first in the Foundational Challenge, which NC State provided to participating teams one month prior to the competition, with the expectation that the teams would come prepared to present their solution on the first day of the competition. In this initial challenge, MBA teams were to address business security threat against the life sciences industry. The teams received details for the Succession Challenge at the end of the first day of the NC State competition, and presented their results on the second day. Judges evaluated the teams’ overall performance in the Foundational and Succession Challenges, selecting three finalist teams to present in the Grand Challenge on the final day of the competition. The remaining teams competed in the Storyboard Challenge on the final day of competition. Follow are winners and runners-up. The Foundational, Succession and Storyboard Challenges were evaluated by 15 judges consisting of Merck and other industry executives from organizations including Exsostar, Intel, Cisco, EY and the National Security Agency (NSA). Four new judges were brought in to identify the Grand Business Challenge from the finalist teams.